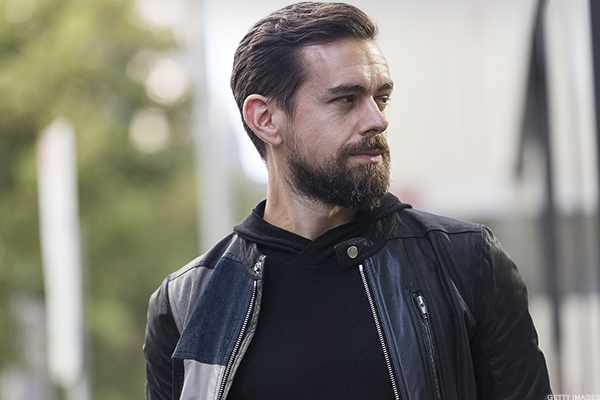 Jack Dorsey's turnaround showed more signs of taking hold in the fourth quarter. The company posted its first GAAP profit, and the improved outlook could lead to something else that investors have long awaited -- an acquisition. Shares of Twitter Inc. (TWTR - Get Report) rocketed on Thursday morning, as Jack Dorsey's efforts to turn around the social media network show signs of taking hold. The improved outlook may even rekindle investor hopes that Twitter will become an acquisition target. Fourth-quarter earnings of 19 cents per share beat expectations of 14 cents per share. For the first time, Twitter posted GAAP profitability with net income hitting $91 million. Revenues grew a modest 2% to $732 million, but were well above forecasts of $686.5 million. Shares jumped as much as 20% following the Thursday morning earnings report, but those gains pared to about 13% by the afternoon as the overall market dropped. Along with enthusiasm over the results, the higher stock price reflects expectations that Twitter could be a buyout target. "Absolutely," said Brad Lamensdorf of Active Alts Contrarian ETF (SQZZ , which holds Twitter stock, regarding M&A expectations. Citron Research predicted in a January tweet that Tencent Holdings Ltd. (TCEHY would buy Twitter, and Verizon Communications Inc. (VZ - Get Report) is a long-rumored suitor. The companies did not immediately respond to a query Thursday. Walt Disney Co. (DIS - Get Report) CEO Bob Iger acknowledged in October that the company had considered a bid for Twitter earlier in the year. Of course, Iger now has his hands full with the purchase of most of Twenty-First Century Fox Inc. (FOXA for $66.1 billion, including debt. Facebook Inc.'s (FB - Get Report) decision in January to focus its news feed on messages from users' friends, over messages from businesses, may steer advertising towards Twitter, Daniel Ives of GBH Insights noted in a report. The fourth quarter was "a breath of fresh air" for investors" who have waited for a turnaround "after years of pain," he added. Unfortunately, Twitter is not attracting many more tweeters. Average users stood at 330 million in the quarter, which equals the prior quarter's count and is a 4% increase from the prior year. "It's not every day we see this much enthusiasm for a tech company becoming a high flyer by managing not to shrink, but here we are," James Cakmak of Monness, Crespi, Hardt & Co., Inc. wrote in a Thursday report. Tweaked algorithms that deliver more relevant tweets have improved engagement of the existing base, Cakmak noted, but Twitter needs new use cases and incentives to attract new users. Engagement among Twitter's existing base is growing. Average daily average users increased 12%, the fifth quarter that DAUs have expanded by double-digit percentage points. Advertising on Twitter's platforms rose 7% to $593 million in the quarter. The move from 140 to 280 characters last fall likely helped, Lamensdorf suggested. "That immediately moves the advertising needle for them because it keeps people on the page longer," Lamensdorf said. "Their advertising was suffering due to the fact the eyeballs on Twitter at 140 characters was not long enough and they weren't getting enough advertising dollars." Twitter could get to $45 to $50 a share as a stand-alone company based on Dorsey's plan, Lamensdorf suggested. A buyout would likely be in that range. "To go beyond $45 or $50 these, guys are going to need to come up with a broadening of the platform," he said, pointing to some of GrubHub Inc.'s GRUB moves. A food-ordering pact with Yelp Inc. (YELP - Get Report) last August contributed to a rise in Grubhub stock from the $50s to around $70. After GrubHub announced a deal with Yum! Brands (YUM - Get Report) Thursday, the stock soared 32% to $92.26. Yum invested $200 million in GrubHub, and will use GrubHub's technology for its online ordering and delivery for the KFC and Taco Bell chains. Twitter's narrative has lurched between hype and disappointment, and Thursday's report will not likely end the swings in sentiment. If Dorsey can make Twitter look less like a falling knife, however, the more likely it is that a buyer finally steps forward.